A billfold with identification was found on the remains of an adult discovered near the bypass Monday morning. Deputy Coroner Greg Mann said the body had been there “for awhile,” possibly several weeks, and was badly decomposed. He could not determine if the remains were a male or female but said it was an adult. Mann said he wanted to wait until the medical examiner made a determination of gender. The person was wearing blue jeans and a long sleeve shirt. A billfold provided the identification of a man who had been in the area for awhile. Mann said he did not know if the male in the identification was a resident here or was passing through. Next of kin is being contacted to the person in the ID. The scene did not provide evidence to help determine cause of death, whether it was foul play or natural causes, Mann said. The body is being sent to the ME’s office in Louisville. 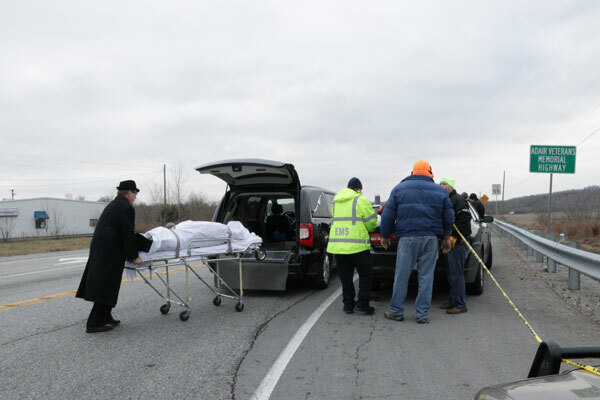 Emergency 911 received a call just before 10 a.m. that a local real estate agent was gathering signs and discovered the body at the interchange of the Veterans Memorial Bypass and Campbellsville Road. Sheriff’s Deputy Josh Durbin arrived on the scene and confirmed there was a badly decomposed body not far from the bypass, located near the northwest corner of the intersection. The body was located around 40 ft. from the guardrail. Deputy Coroner Mann is working the case for the coroner’s office and Kentucky State Police will investigate. Mann asked if anyone knows any information or knows of anyone who is missing, to call 911 or KSP at 270-384-4796.